designed to affect the entire organ. 18 pipes Metal, 1-12 from Gt. 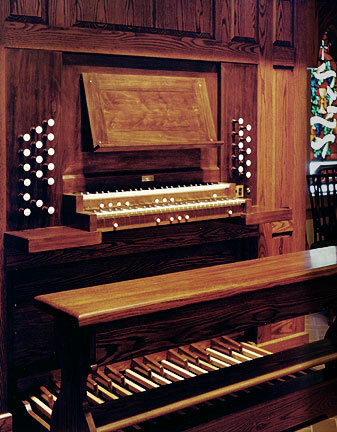 Attached console of the suspended type is built into the organ case. Manual keyboards are of cow bone and ebony. The pedal keyboard is of maple wood with walnut sharp keys and conforms to measurements of the American Institute of Organbuilders. All key action is mechanical. Suspended action with automatic compensation for variation in temperature and humidity are employed for the key action. A balanced swell expression pedal and music light are provided. Drawknobs are of turned Gaboon ebony. A solid state, capture type, combination action is provided with thirty-two levels of memory. Sforzando and Great to Pedal pistons and toe studs (reversible) are also provided. There are eight general pistons and three divisional pistons/toe studs for the combination action. Windchests are of the slider and pallet type. The stop and coupler action are controlled by electric solenoids with solid state controls. A new high speed organ blower is located within the organ case. A special silencing cabinet which houses the blower ensures quiet operation. A single bellows provides a sufficient yet slightly flexible supply of wind. New pipework was fabricated by Aug. Laukhuff GmbH (Germany) and Russell and Company to specifications developed to provide the proper tonal characteristics in consideration of the acoustics of the church. The scaling, voicing, tonal finishing were carried out in the best traditions of European and American organ building. 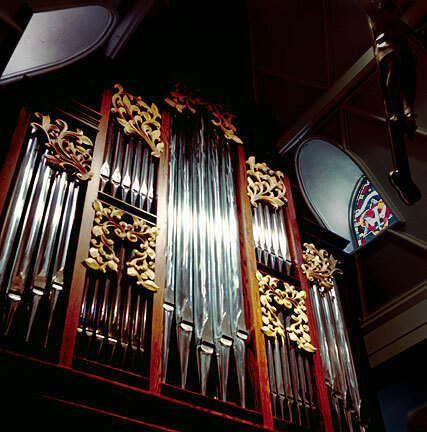 Historical traditions of both organ performance and design, as well as choral accompaniment will be the prime considerations in the scaling, voicing and tonal finishing of the instrument. The organ will be tonally finished only in its final location to ensure an ideal balance of the tonal resources with the acoustics of the room. 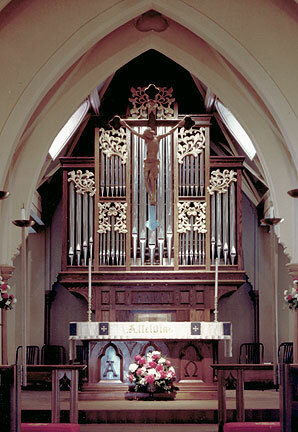 The organ is housed in and behind a free standing case of red oak in traditional frame and panel style. Fac;ade pipes are of the 8' Principal and 4' Octave stops of polished zinc, and planed and polished 28% tin alloy. Hand-carved pipeshades of bass wood adorn the façade of the case.